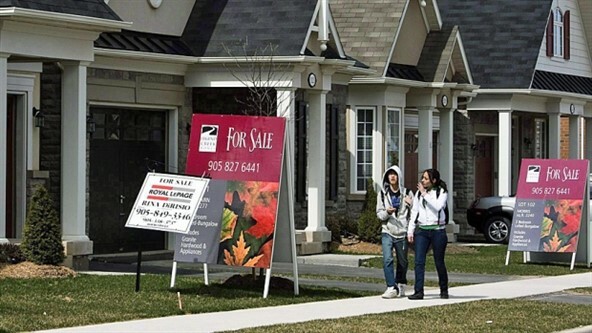 CMHC says that “strong evidence of problematic conditions” remains for Canada’s housing market as growing house prices clashes with a slowing of adult population growth and a decrease in disposable household income. The agency’s early warning system report shows that evidence of overvaluation at the national level remains moderate but strong evidence is seen in Toronto, Vancouver, Hamilton and Victoria. “We’ve maintained Canada’s overall rating at strong evidence of problematic conditions as we continue to see moderate overvaluation and price acceleration,” said Bob Dugan, Chief Economist. Vancouver is now showing moderate evidence of overheating due to townhomes and apartments seeing high demand leading to multiple-offer situations and higher prices, the report warns. Toronto continues to show strong evidence of problematic conditions. Economic fundamentals like income and population growth cannot fully explain the rapid growth in house prices in Toronto,” said Dana Senagama, Principal Market Analyst (Toronto). CMHC also highlights that evidence of overbuilding has increased from six centers to seven with rental apartment building in Quebec outpacing demand. There is also moderate to strong evidence of overbuilding in markets in the Prairies.